The ABC Series of PCB Holders! Twenty-five years on the market, the ABC Adjustable Board Cradles™ were the original and very first stand-alone, open frame board fixtures on earth and are still the most popular Printed Circuit Board holders or fixtures on earth for good reason: They were to designed for multi-purpose functionality PCB assembly, soldering, desoldering, rework, repair and R&D circuit design and lab prototyping. The ABC Cradle is an industrial quality multi-tasker at your bench. Its unique design securely holds multiple PCB's within its adjustable tracks. Boards are inserted and removed from either the top or by slide entry into the dove-tailed tracks. Whether prototyping, small production runs, reworking PCB's, or positioning your PCB above your pre-heater, the ABC is your bench helper. • Lightweight (So Helpful!) & So Very Stable Under Microscopes! ABC's Are Totally Independent from either a pre-heater or any upper reflow heating zone. 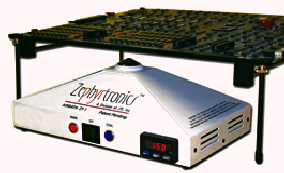 Zephyrtronics pioneered and introduced the "independent" concept 20 years ago. ABC's Are Swappable and inter-changeable -- because they are "independent" from any PCB rework station (big significant advantage), speeding up production, prototyping runs, rework and repair. See video. Dove-Tailed PCB Tracks! All ABC's feature our signature dove-tailed linear grooves for inserting PCB's into the tracks and locking knobs to firmly secure them in position. 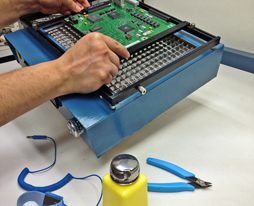 Open Frame Table-Top Design permits very large military and satellite boards to sit directly atop the frame during assembly, preheat, soldering or desoldering tasks. This is far superior to cantilevered-type fixtures that stress substrates, vias, laminations causing fissures or weakened solder joints. ABC's support your entire PCB. ABC's Are Flippable! With just four extra posts, the ABC's become "flippable" for thru-hole soldering and desoldering jobs and is ideal for inspection work. Our, who solder and desolder thru-hole devices and connectors rave about this attribute. And, yes we pioneered it. 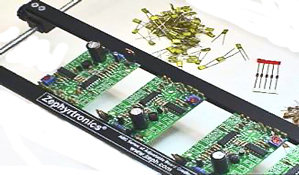 ABC's are Inclinable in the 2-Post Position for PCB thru-hole component stuffing, cutting leads, board prep or assembly with "slide along" capacity. (See photo at right or the video above). New! 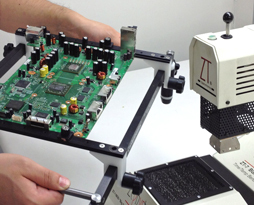 Our new ABC-XYZ Adjustable Board Cradle™ (left photo) is for high volume repair as with video game console PC boards. Many game console PCB's are thinner than typical PCB's and flex with heat when game consoles are played causing solder joint failure. Such thin PCB's require racking them on non-flexing plates during any rework with any machine. The ABC-XYZ permits pre-racking multiple PCB's into metal, non-flexing plates which then can be inserted into the ABC-XYZ's tracks. This speeds up your repair process saving time and increasing your profits. The ABC-XYZ has spring-loaded Z-Axis posts to lower PCB's down to the perfect height above the pre-heater below when using such non-flex plates! Here's Why PC Holders Must Be Independent From Both Any Preheater or Upper Heat Zone. Preheaters With "Built-In" PCB Holders Limit the Tech's Options. They Can Not Be Flipped Over for Inspection or for DeSoldering Thru-Hole Components. 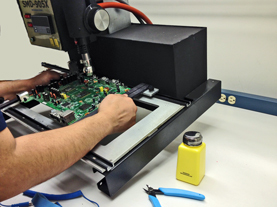 Rework Stations With "Built-In" PCB Holders Punish Techs & Prohibit Swapping PCB's to Speed Up Rework; They Slow Productivity & Anchor the PCB to a Single Bench. Twenty Years of Quality History! All ABC's tracks accommodate PCB's From 1/32" (2.4mm) to 1/8" (3.2mm) thick. However, our new ABC-XYZ will accommodate PCB's clear up to 1/4" (6mm) thick. Below there is an ABC tailor-made for you company's range of PCB's. Our "Enfant" or Tiny ABC's: Ideal for working with smaller PCB’s and where bench space is limited. Note, the ABC-Enfant Series ONLY works with the ZT-1-CLS Preheating AirBaths and smaller industry pre-heaters (they do not straddle larger pre-heaters. ABC-TT: The ABC-TT will hold within its tracks PCB's up to 8.7" x 15" (22.5cm x 38cm). Keep in mind that even larger boards can easily sit right on top of the table top frame, so you are not limited to just 8.7" x 15" PCB. The ABC-TT has three tracks, with the center track moveable. ABC-TQ: The ABC-TQ will hold within its tracks PCB's up to 8.7" x 15" (22.5cm x 38cm). Keep in mind that even larger boards can easily sit right on top of the table top frame, so you are not limited to just 8.7" x 15" PCB. The ABC-TQ has four tracks, with two movable center tracks. The ABC-XYZ has all the features of our world-famous board fixtures and holds PCB's clear up to 1/4" (6.3mm) thick and to 13.5" x 20" (34cm x 51cm) within its movable tracks and features multiple "gripping clamps" for odd-shaped PCB's. It also has 4 spring-loaded Z-Axis posts for height changes above preheaters when using PCB auxiliary plates, typical with video game console repair. Our Classic ABC's: Ideal for working with all sizes of PCB’s and also with any Zephyrtronics AirBath Preheater. ABC-1: The ABC-1 will hold within its tracks PCB's up to 10" x 20" (26cm x 52cm). Keep in mind that even larger boards can easily sit right on top of the table top frame, so you are not limited to just 10" x 20" PCB's. The ABC-1 comes with 3 tracks, with the center track moveable. ABC-1Q: The ABC-1-Q will hold within its tracks PCB's up to 10" x 20" (26cm x 52cm). Keep in mind that even larger boards can easily sit right on top of the table top frame, so you are not limited to just 10" x 18" PCB's. The ABC-1Q has 4 tracks, with 2 movable center tracks. ABC-2: The ABC-2 will hold within its tracks PCB's up to 20" x 20" (52cm x 52cm). Keep in mind that even larger boards can easily sit right on top of the table top frame, so you are not limited to just 20" x 20" PCB's. The ABC-2 comes with 3 tracks, with the center track moveable. ABC-2Q: The ABC-2Q will hold within its tracks PCB's up to 20" x 20" (52cm x 52cm). Keep in mind that even larger boards can easily sit right on top of the table top frame, so you are not limited to just 20" x 20" PCB's. The ABC-2Q has 4 tracks, with 2 movable center tracks. The ABC-XYZ Accommodates PCB's Up to 1/4" (6mm) Thick. ©1996 - 2011, 2012, 2013, 2014, 2015, 2016, 2017, 2018, 2019 by Zephyrtronics®. All rights reserved. The information you receive online from Zephyrtronics® is protected by the copyright laws of the United States. The copyright laws prohibit any copying, redistributing, retransmitting, or repurposing of any copyright-protected material. Zephyrtronics is the registered trademark property of JTI, Inc. "The Science of Zephyrtronics" and "Simplicity Through Innovation" and "AirBath" and "AirPencil" and "AirPick" and "AirMill" and "Zephlux" and "Zero Balling" and "Zero Residue" and "Post Cooling" and "Post Cooler" and "AirBath" and "SolderGlide" and "SolderMill" and "ZeroTouch" and "Just So Superior" and "STILL Made in the USA" are the protected trademark property of JTI, Inc. Moreover, Zephyrtronics® and LowMelt® and ZeroLead® and AirFountain® and Fountainhead® are the protected and registered trademark properties of JTI Inc. The forenamed are federally registered trademarks with the Government of the United States of America. *The above names are the registered property of their respective owners.